Set against the spectacular backdrop of St. John's, Newfoundland, the hit Canadian series finds the Doyles dealing with Mal's mortality, the not-so-funny world of stand-up comedy, a cold crime too close for comfort, and the usual laughs, fistfights, car chases, lager, and family skirmishes. 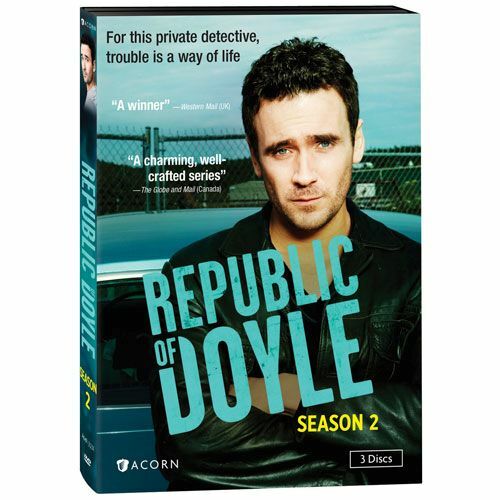 Sean McGinley (Single-Handed) and Allan Hawco (Love & Savagery) are Malachy and Jake Doyle, a father-and-son detective team that solves intriguing cases while mismanaging their own relationships. 13 episodes, 3 DVDs, SDH. A case involving national security takes a bizarre twist. Jake discovers that Leslie is moving on, but beautiful new Crown Attorney Allison Jenkins arrives in town and turns his head. To sniff out the whereabouts of a stolen necklace, Jake plays prisoner. But tracking the incarcerated thieves gets even riskier when an old foe turns up on the inside. An obnoxious 80's-era comedian on the verge of a comeback hires the Doyles to discover who is sending him frightening messages. Meanwhile, Allison has news for Jake that shakes up their relationship. A well-known developer is murdered-and someone close to Mal is the prime suspect. The Doyles are caught between harboring a fugitive and finding the real killer. Ahead of her wedding day, a bride-to-be is the target of increasingly dangerous acts of sabotage. A resentful maid of honor and two former fiancees complicate the Doyle's task. An old family friend has gone missing at sea, but the story of him being washed overboard sounds fishy. As the Doyles dig in, they uncover secrets about their pal-and an unusual motive. When a noted psychiatrist has a terrifying-and public-breakdown, Jake investigates her ambitious associates and a volatile patient. But this case requires him to become a patient, too. Rose's ex has turned up with a bounty-hunting case that promises a big payday. But the Doyles aren't the only one looking for the prize-and their rivals aren't above murder to get it. Episode 209: Will the Real Des Courtney Please Stand Up? The Doyle's goofy assistant Des has been arrested for armed robbery-but has no memory of the incident. As the whole clan races to clear him, they unearth some unexpected information. Annoying crime novelist Garrison Steele returns to tail Jake as inspiration for his next book. But the murder they are investigating may entangle some dirty cops too. The robbery of an illegal gambling den nets some big fish-including the mayor. The stakes get higher when blackmail and murder are added to the mix. A controversial housing development is the target of suspicious activity. It also threatens to derail the mayor's reelection. Jake must uncover just how far the mayor will go to win. Jake's bitter ex-partner has kidnapped Des and Tinny- and has a dangerous demand for their return. What the Doyles are forced to do may cost them everything.